I have written before about Ramanujacarya, the great Vaishnava saint who lived between 1017 and 1137. If you look at his year of birth you’ll see that his 1,000th anniversary will be coming up in 2017. Already preparations are being made for grand events all over India and indeed the world. Today is his appearance day, so I thought I would at least write a few words. It is the measure of a man, they say, how he is remembered after his passing. And for how long. One thousand years is a long time, but the years have not dulled the level of adherence to the teachings and role model of Ramanuja. Rather, they have simply increased it exponentially. Millions now base their spiritual practices and religious conceptions on his words. Throughout southern India, where he travelled and taught, the parampara he strengthened is vibrant. And with the travelling out from India of many Vaishnava families, the path of Sri Vaishnavism is growing in the western world also. Just three weeks ago I was in New Jersey, USA. Our family went there for our daughter Tulasi’s engagement ceremony. We travelled for about an hour up to a small village called Pomona where there was a temple. I am from England so expected to be visiting the average northern India Hindu temple with a collection of gods for all seasons and tastes. I was very pleasantly surprised to discover a Ranganatha temple with affiliation to the Ahobilam Azhagiyasingar, the same community that send me the Nrisimhapriya magazine every month. Very beautiful archa-murtis of Ranganatha and of course Narasimha, with all of the Alwars, and a schedule of (click here) vibrant festivals. 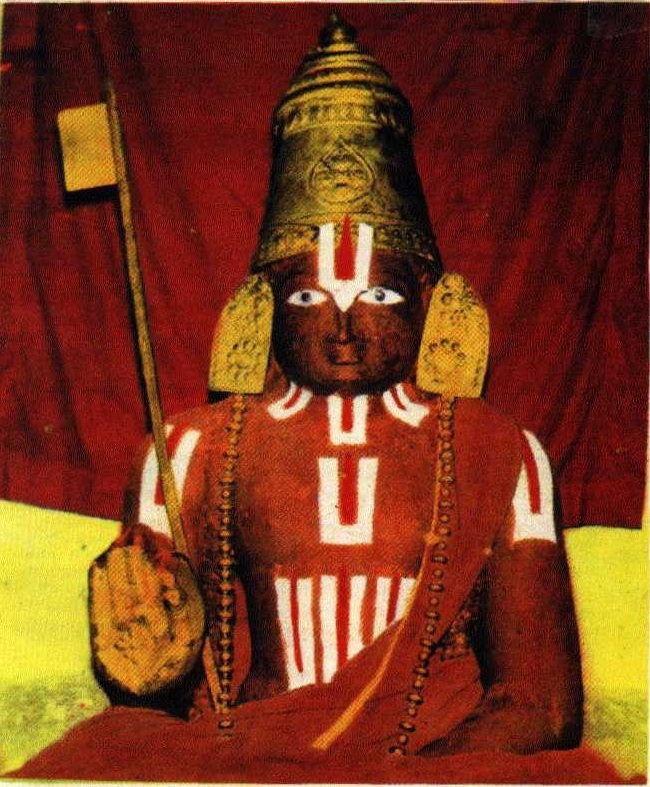 Although this particular branch of Vaishnavism would also trace their origins back to Adivan Shatakopa it is without doubt that Sri Ramanujacarya is the one common spiritual ancestor to whom they are indebted.